Obtaining absolute PCR quantification currently requires the laborious preparation of standards and acquiring a standard curve, thereby wasting reagents and using valuable plate real estate. In addition, the traditional qPCR analysis method determines the “cycle threshold”, Ct or Cq, which varies for different assays, different machines, and varies from plate to plate, thereby making the Ct value hard to interpret. DNA Software has made a breakthrough in understanding the mechanism of PCR amplification. Our new product, qPCR CopyCount™, allows for any qPCR curve to be analyzed to directly determine the absolute number of copies of DNA at cycle zero. 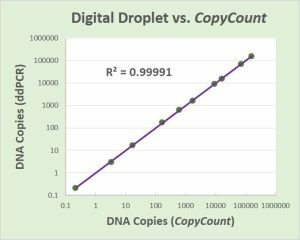 The DNA copy count is the quantity that every biologist wants and the results provided by qPCR CopyCount™ have unprecedented relative and absolute accuracy. How can qPCR CopyCount™ benefit your research as a Digital PCR alternative? Utilizing your current lab equipment and methods, and providing you higher sample throughput than Digital PCR, qPCR CopyCount™ provides absolute quantification with outstanding accuracy, within 5% errors. Rather than the need for expensive new equipment, qPCR CopyCount™ makes every qPCR reaction an absolute reaction. qPCR CopyCount™ requires no quantification standards and provides users more sample wells rather than control wells. In other words, “more real estate for your plate”. Obtain absolute quantification and DNA Copy Number of your qPCR data within 5% errors. See DNA Software Cloud Edition in Action!